Offering performance, a comprehensive features list, and a decent build quality, it excels in almost every area. Acer has a reputation for creating feature-packed laptops for a reasonable price. True to form, the Acer TravelMate 4262WLMi (£869 ex. VAT) is cheaper than most of the machines in this group, with only Toshiba's Satellite Pro A120 available for less. Despite the price, the 4262WLMi is unbeatable when it comes to components. Connectivity is its main selling point, and the Acer is the only machine on test that takes advantage of emerging 3G technology. A Vodafone SIM card is housed under the battery, and enables access to emails and the Internet. We found the accompanying software intuitive, and browsing the Internet using 3G is a similar experience to using a regular broadband connection. Wireless and fixed networks are equally well catered for, with integrated 802.11a/b/g Wi-fi and Gigabit Ethernet. The Acer also impressed with the range of ports - from S-Video to DVI - allowing connection to a range of digital and analogue monitors and projectors. Featuring a five degree curve, the keyboard is an ergonomic solution, enabling your hands to point inwards when typing. This lessens the risk of RSI (Repetitive Strain Injury). We found the keys moved quietly and with precision, although it took time to adjust to the curved layout. Build quality is good, with a strong chassis made from tough plastics. The screen is also resilient, although the price of this robustness is a 3kg weight. The display is a 15.4-inch standard TFT panel. Bright and sharp, with a resolution of 1280 x 800 pixels, the display is good, but lacks the vibrancy of Lenovo's 3000 N100. Graphics come in the form of nVidia's GeForce Go 7600 - a mainstream option that returned a 3DMark 2003 score of 5025. This is easily enough for business applications, multimedia work and most other needs, placing the Acer top of the group. A respectable battery life of 223 minutes was achieved, under test conditions. An Intel T2300 processor is at the heart of the machine, running at 1.66GHz. 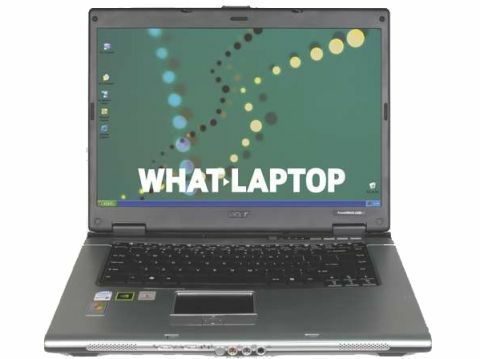 This is not the quickest processor on test, but with help from 1024MB of DDR2 memory and an effective motherboard design, the TravelMate achieved a score of 223 minutes in our MobileMark 2005 benchmark. Once again, this reflects the Acer's ability to run applications without lag.